How do you like your gummies? 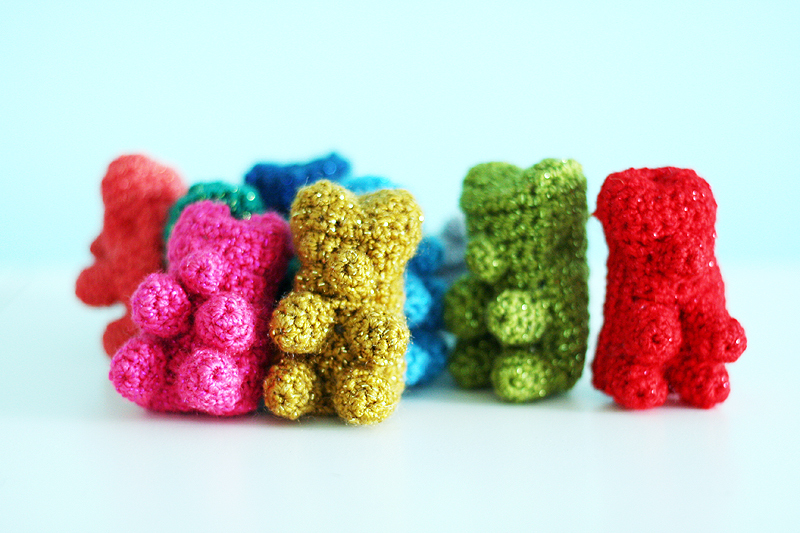 These sweet sparkly gummy bears are looking for a new home with YOU! But I’ve sort of been hemming and hawing over exactly what to do with them, and wondering how people would prefer to wear the the gummy the most. I know that everyone has different preferences, but it would be interesting to see if there were any kind of consensus or majority opinion? mount 1,2, or 3 bears on a headband. The other thing I thought of was hanging them on a ball-chain necklace. I personally use hair clips more than pins, but I think they make for awfully cute brooches…. Oh, p.s. they are about 2 inches tall :). Ok now that I am looking at a photo, maybe more like 3 inches tall, with some slight size variance in different colors due to the slight variances in yarn weights. 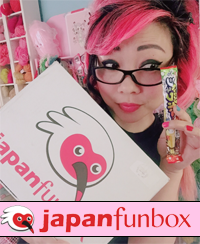 60 Responses to How do you like your gummies? Are they actual size? awesome! I recon a necklace would be awesome. Aha, i meant actual size in the photo. not thinking straight! They are about 2 inches tall. I’ll put that in my post! 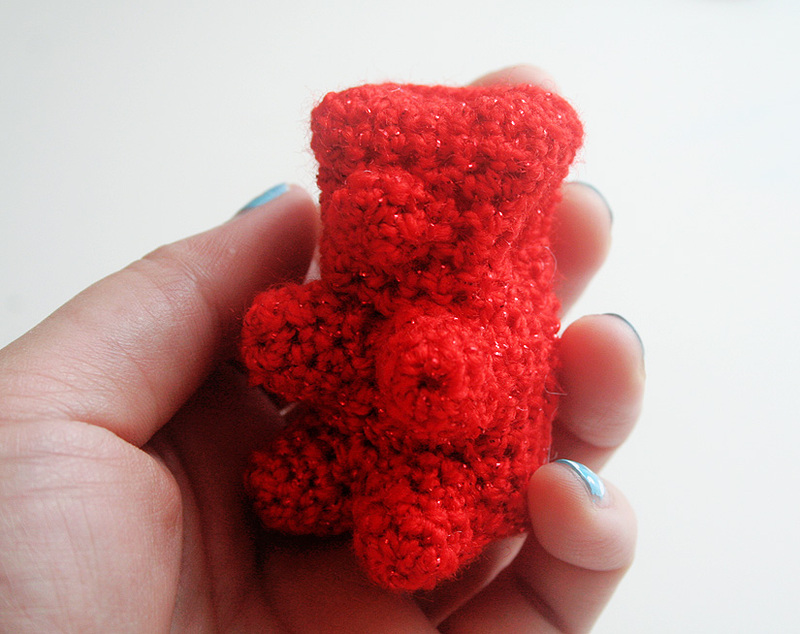 I thought gummy bear rings would look so cute, but if they are 5cm long. Phone charms……..but you can’t wear them! Dangly Earrings!! I made some googly-eyed ghost dangly earrings for halloween and they were about the same size (2 inches) and they were fine. That’s all I could come up with right now, but I’ll post again if I think of anything else. Personally I’d like to have a brooch — or maybe a zipper pull! Zipper pull woukd be super cute!! I like the zipper pull idea, but I think he would get wrecked or get his head ripped off heheh. I think a hairband would be so cute!!!!! 🙂 I would totally wear that!!!!!!!!!!!!!!!!!!!!!!!!!!!!!! LOL! put them on the ends of scarves! maybe a candy button scarf? that would be SWEET! or make a rainbow airheads extreme scarf with those gummies at the ends or dispersed throughout it YOW i would LOVE that!! They look so cute all together! But that Headband you described sounds amazing! i’d stitch them top to tail to form a rainbow scarf, i already have 2 reqeuest for them if i find a way to do it! I think their size and 3D-ness make them a bit weird to wear as a scarf (my personal opinion!) 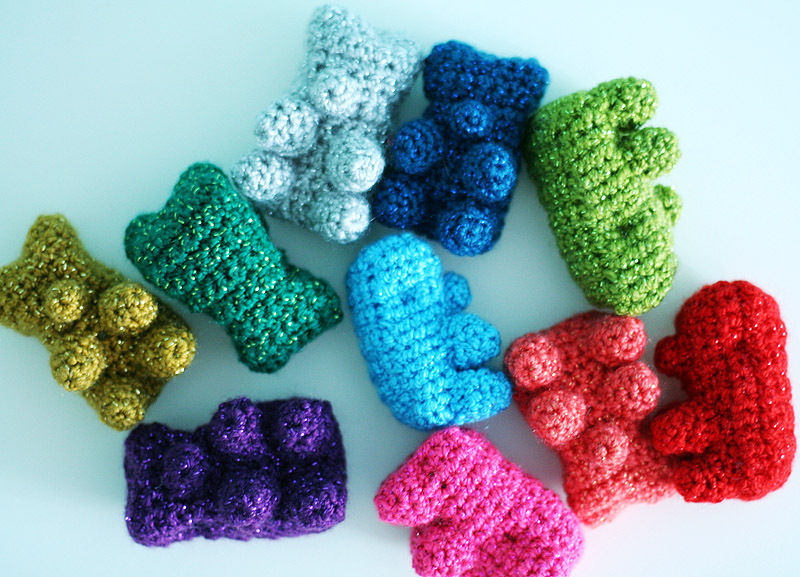 but I plan to translate the idea for a scarf soon (more 2 dimensional bear shapes and larger sizes). regardless of their bulkiness, there is probably enough die-hard gummi bear freaks out there to make it work – i have one for an employee! either that i was thinking a lanyard would be a lot of fun considering there are quite a few businesses that have security badges people have to wear all the time. attach the lanyard at the top and the tag hook in the bottom – super cute. I think they kinda just look cute hanging around, too, but my whole spiel has always been that I wanted to take the cuteness of plush toys and apply them to useful items! I’d love to see these on a headband! I’d wear them. God I wish you could make them into slippers.. Slippers! That would be funny. I’m gonna think about that…. have you ever thought of glueing them on hair ties? it would be cute to put over buns and stuff. I like that idea. I’d probably sew them. But I’d also worry they’d get a little mangled in the process of getting put in a ponytail! I would rock that headband like no tomorrow 🙂 Sign me up for 3 of them off the bat! I have not read the previous comments, but thought about a belt? I’d have a bowl full on the table for little children to play with!! they’re adorable! How much would you charge for a whole heap of loose ones? I reckon they’d be awesome kids toys as is. I am not sure yet. They may take an hour or two of work each. 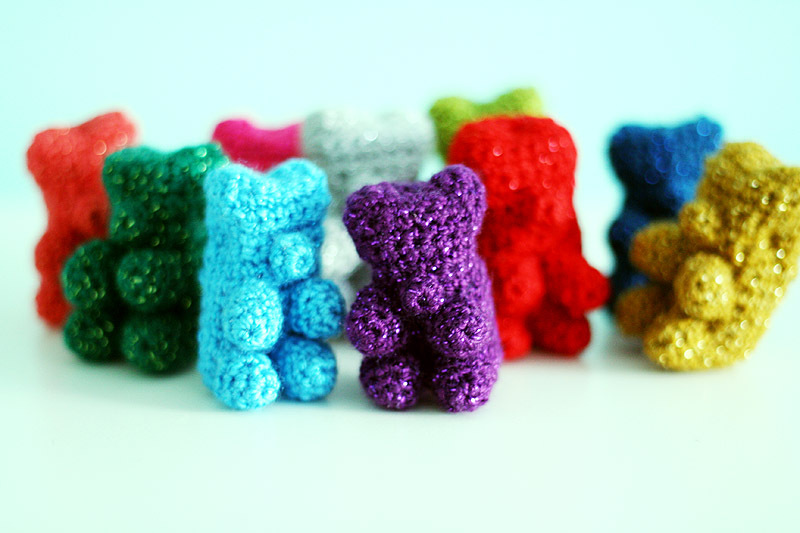 My goal has always been to take the cuteness of crochet toys and apply them to useable and wearable items, so I always kind of have this weird mental roadblock about selling toys hehheh. I NEED one to sit by my computer everyday at work!!!! Are you going to share the pattern some day? Of course you’ll have to give me one! ‘Packets’ of mini gummi bear hairclips, (2 or 3 in a packet)?? I NEED, not want, NEED a gummy bear hair clip! I am starting to think I will just list them naked with options for people to choose a hair thingie, a pin thingie, or a necklace thingie! I would suggest that you secure them around dowels of a cot, not on every dowel, and the baby could slide them up and down. I also think they would look great on an indoor window sill, in colours that tone with the room colour scheme. Oh, what tiny little dearies. Lovely idea, and what a work! I would love to have a whole family, and I think they would be great as earrings. Oh My Gosh!! I need the pattern! They are so cute!! Hi! It’s actually a free pattern at LionBrand.com. 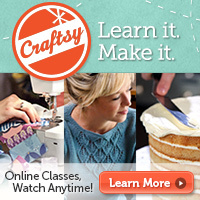 You need to register for an account if you don’t already have one, but there are tons of free patterns over there! LOVE LOVE LOVE the gummies my teenage grandchildren are going to go crazy!!! Pingback: Got tiny balls…of yarn | Trust no stitch! I would make key chains out of them.